On Tuesday afternoon I drove up to East Bergholt, in Suffolk, to the red brick cottage which is the home of Penny Bhadresa and her husband. Penny creates the most beautiful colourful lino cut prints, sometimes also incorporating chine colle in her technique, which means including elements of collage in the print. We sat in her cosy sitting room with a cup of tea and chocolate chip cookies, while she told me about her work. Having studied history at university she initially went into museum work, and it was only later that she began working on her art, initially by herself. Her husband told me that when she decided to study art at college, she had already accumulated such an impressive portfolio that she was allowed to skip the Foundation and first years. His teaching career gave her the security to make a complete switch in her own career. 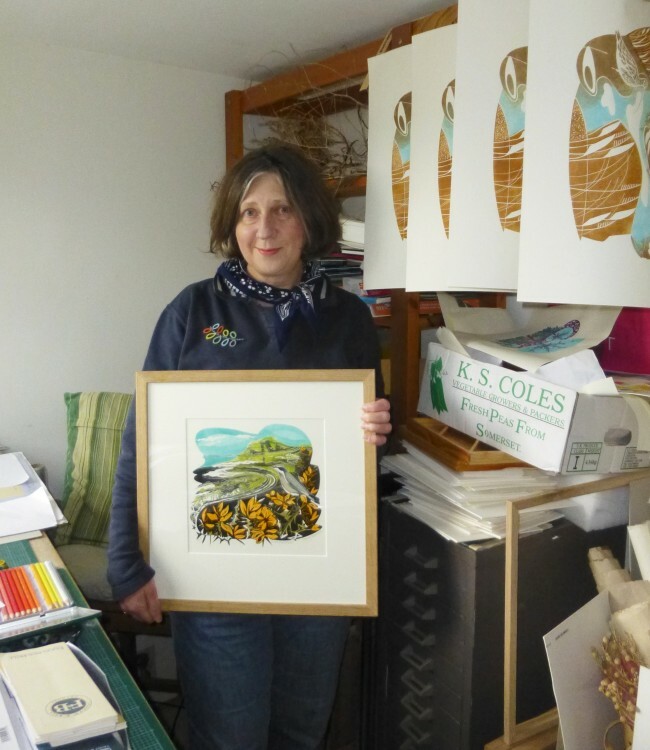 Her prints include East Anglian scenes, those inspired by visits to Italy, wildlife – herons, hares, and fish – and flowers. One of the prints we are having at the show was created by Penny for the Benjamin Britten centenary, and includes images of Snape Maltings, the river with its sailing barge, the curlews (‘Curlew River’), and Barbara Hepworth’s sculpture from the grounds of the Maltings – all woven together in one bright image. Penny pointed out to me that her prints are rarely rectangular, but are often curved organic shapes, with sweeping curved lines within them. She works in a little workshop in her garden, and I photographed her in there, beside the rack with drying prints, and holding ‘To the coral beaches’, a print of the Isle of Skye. The following morning I headed off to the home of Jean Constantine at Thurston, near Bury St Edmunds. Jean creates lovely images using hand made felt mounted onto panels. Her work is usually inspired by the animals and birds found in the Suffolk countryside. I was particularly taken by one of the pheasants! Jean told me she had studied art initially in Ipswich, followed by a BA in textiles at West Surrey College of Art and Design. (By a strange coincidence, one of her tutors in Ipswich, Glynn Thomas RE, is also exhibiting with us at the Lexden Arts Festival this year!) She buys fleeces which she cards and dyes to create the colours she needs, and layers of the wool fibres are built up together with inlaid yarns and pre-felted shapes, and then hardened by pressing and rolling. In this way the colours mingle to form a solid mass of texture. Jean adds embroidery as a final embellishment to emphasise and enhance the details of the image, and the felt is then mounted onto board ready to be displayed. 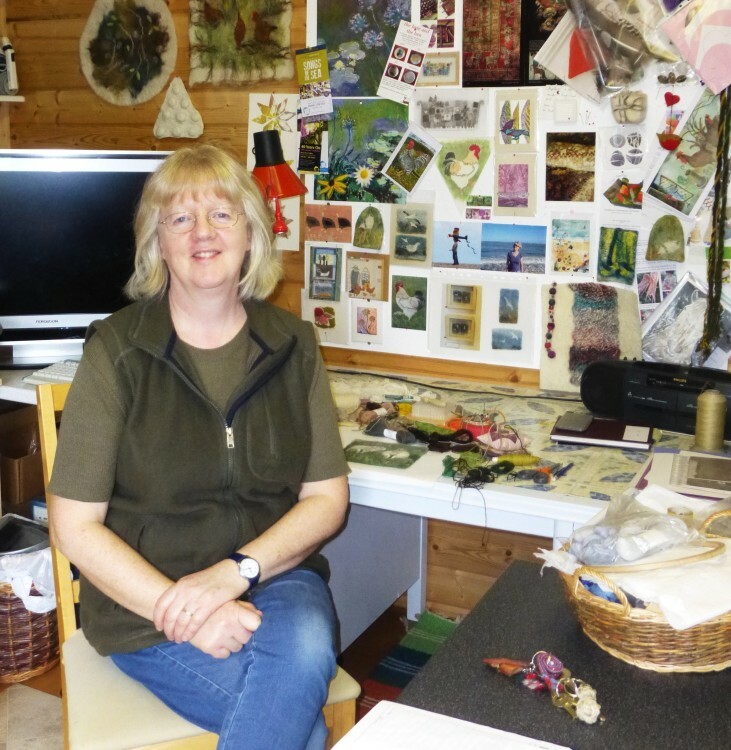 Jean also works in a garden studio. She told me that over the years she had used all manner of different sheds, but had this ‘dream studio’ built when she and her husband moved to their present home. It has the advantage of two rooms, so that she can keep the dry and wet stages of her work separate. I photographed Jean in the ‘dry’ room where she was working on some Sussex Ewes – which will be coming to Lexden! I’m really looking forward to hanging all of the beautiful work that she will be bringing us. Like Penny, Jean is also a member of the Suffolk Craft Society, and by visiting their website www.suffolkcraftsociety.org.uk and following the links to makers, and then textiles, you will be able to see some images of her work – two colourful cockerels!